Two senators are pushing the Trump administration to use regulation to target exorbitant air ambulance charges faced by airlifted patients. Sens. Claire McCaskill (D-Mo.) and Roger Wicker (R-Miss.) led a Monday letter to Transportation Secretary Elaine Chao to urge more oversight and support for consumer complaints. The lawmakers represent states that have seen headlines with sticker-shock stories of patients finding themselves facing tens of thousands of dollars in charges after being airlifted to a hospital. 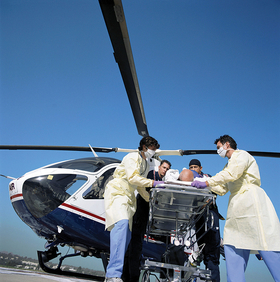 The Senate continues to mull changing air ambulance regulation through its upcoming Federal Aviation Administration reauthorization bill. State efforts to curb prices have faced a hurdle in courts due to the Airline Deregulation Act, which prevented federal regulation of airline prices. "Congress hardly could have imagined when the ADA was passed nearly 40 years ago that it would block states from overseeing healthcare services," McCaskill and Wicker wrote. "Given this dynamic, the Department of Transportation (DOT) should aggressively and effectively exercise its authority as perhaps the only regulator over air ambulance operators." The senators have asked Chao to explain how the Transportation Department is investigating consumer complaints against air ambulance operators and to specify how the agency is managing oversight and investigations of these operators. The letter requests a thorough explanation of the authorities the department has to regulate charges and require insurers to cover "reasonable costs," and asks whether the Federal Trade Commission or state attorneys general can prosecute air ambulance operators on behalf of consumers. The lawmakers reference a 2017 report from the Government Accountability Office that found the median charges from air ambulance operators doubled from 2010 to 2014, from about $15,000 to about $30,000 per trip. "Anecdotally, it is clear that a greater share of this cost is being passed along directly to consumers through a practice known as balance billing, but GAO was unable to determine the prevalence of this practice because of a lack of data," McCaskill and Wicker said. McCaskill for months has been probing balance billing issues including the charges left for patients by air operators and insurers that refuse to shoulder the full cost of transport. States are also increasingly taking up legislation to address balance billing, but their authorities are limited by ERISA law.